Our heroes are transported to Axis, the Plane of Law, where they must uncover the disappearance of Taldor’s ascended emperor. 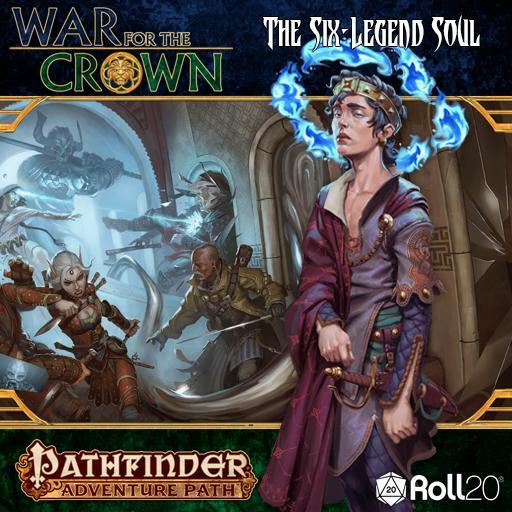 “The Reaper’s Right Hand” is the fifth module in the War for the Crown Adventure Path, designed for PCs of 13th level. At this level adventures really need to ramp up the scope and challenge rating of what the PCs are facing. The module does a brilliant job of upping the stakes by depositing our heroes into Axis, the plane of law, as they must search for the missing ascended emperor while dealing with a diverse cast of extra-dimensional beings and troublemakers. The PCs infiltrate the city of Zimar to gather evidence and finally confront Maxillar Pythareus. The fourth module in the War for the Crown Pathfinder adventure brings our heroes to the militarized city of Zimar. City in the Lion’s Eye is designed for 10th level PCs who have completed the previous three modules of the Adventure Path. While if offers some neat challenges in demanding a more stealthy and disguised approach, much of its urban encounters and plot threads feel far too similar to the last module, The Twilight Child. Pose as local nobles and win the hearts and minds of the people of Meratt in Part 2 of the War for the Crown. The sophomore adventure in the War for the Crown Adventure Path follows more of the political intrigue and social maneuvering from the first. It’s designed to run directly after Crownfall, with PCs beginning at 4th level and advancing to 7th at the conclusion. In Songbird, Scion, Saboteur, the PCs travel north to the county of Meratt, assuming the role of long-lost nobles, hob-nobbing at posh parties, helping the local populace with various odd-jobs and missions, and culminating in the PCs’ invasion of the ruling noble. Every new edition of Dungeons & Dragons has its naysayers, but in the mid 2000s Fourth Edition’s announcement was especially volatile compared to the widely beloved 3.5 edition. So much so that one company split off and created their own RPG system heavily based on 3.5 edition. Pathfinder did the unthinkable and proved more popular than Dungeons & Dragons for several years, until Dungeons & Dragons Fifth Edition arrived in 2014. My own experience with Pathfinder is quite limited. When we first got into doing role-playing games online via Roll20, we actually started with Pathfinder, playing for several months. That game was cancelled when our GM abruptly left, and it would be several months before we got bit by the RPG bug again, first with Shadowrun and then with D&D 5E.